Personalize the player frame around your slide content with colors and fonts that complement your course design or match your brand. And if you’re using the modern player, you can also choose a button style—icons, text, or both icons and text. 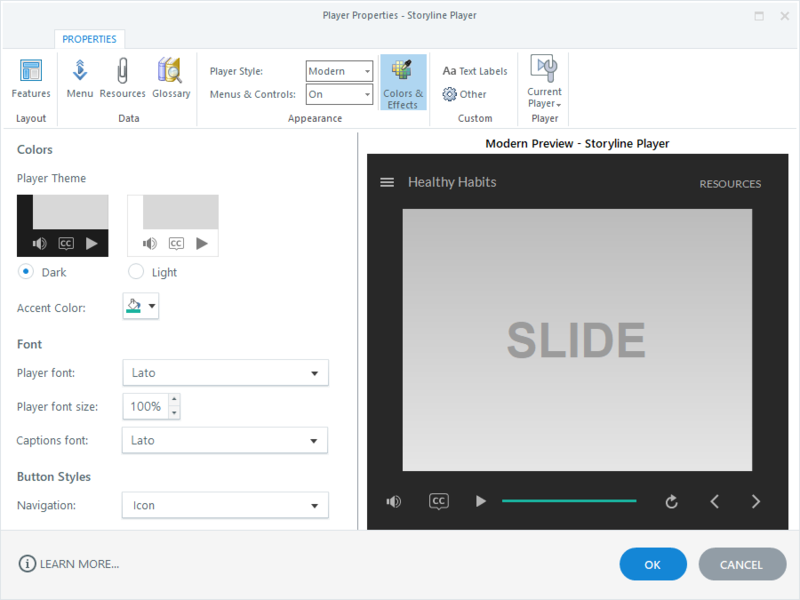 It’s super easy to customize colors, fonts, and button styles for the modern player. Here’s how. 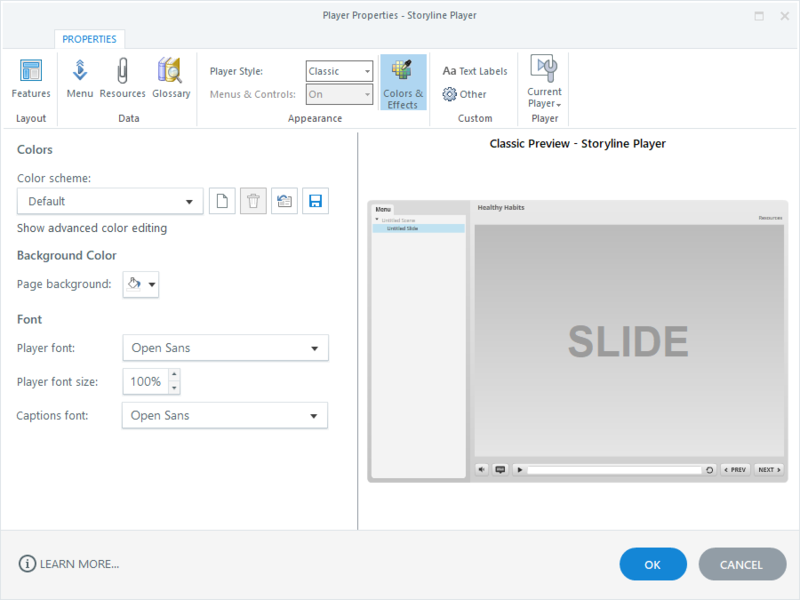 Go to the Home tab on the Storyline ribbon and click Player. Click Colors & Effects on the ribbon, then choose your colors, fonts, and button styles. See below for details. Select a dark or light player theme, then choose an accent color from the color selector (the default accent color choices come from your theme colors). The neutral tones of the dark and light themes allow your content to be the focus of learners’ attention, while the player performs a supporting role in the background. The accent color is used throughout the modern player to tie it all together. For example, the accent color highlights the current slide in the menu, identifies the selected tab in the sidebar, and shows the progress of the seekbar. Choose a player font for the text that appears throughout the player, including the course title, the menu, and navigation buttons. If your course has closed captions, you can also choose a font for those captions here in the player properties. And you can increase or decrease the font size for all player elements and closed captions by adjusting the font size percentage. It defaults to 100%, but you can choose any percentage between 75% and 200%. Tip: To customize the text for navigation buttons, edit the text labels in your player properties. Note: Classic player colors and fonts only work on desktop and laptop computers—except the captions font, which works on all devices, including tablets and smartphones. See this interactive demo to know which classic player properties work on mobile devices. Here’s how to customize colors and fonts for the classic player. Click Colors & Effects on the ribbon, then choose your colors and fonts. See below for details. Choose a built-in color scheme or a custom color scheme that you previously created from the Color scheme drop-down list. The preview pane on the right side of the window will automatically update so you can see how your color scheme looks. Here’s how to create a custom color scheme. Use the color selector to choose a new color. (If you see top and bottom colors, it means the item is a gradient composed of two colors.) If you don't see the color you want, click More Colors to enter a custom color value. Repeat steps 2-4 for each player element you want to customize. If you change your mind and want to undo the edits you made, click the Reset button (it looks like a window icon with a backward-pointing arrow). By default, a custom color scheme is only stored in the project file you’re currently working on. If you want to reuse a custom color scheme in other Storyline projects, just click the Save button, give your color scheme a name, and click OK. The deleted scheme will no longer appear in your color choices. However, if you delete a color scheme that's applied to another course, it won't be removed from that course; it'll just be stored in that particular project file. The page background color appears behind your published course. Learners may see this color around the outside of your player frame. And if you made the base of your player transparent, the page background color will show through the player. Use the Page background selector to choose a color. The color palette comes from your theme colors. If you don't see the color you want, click More Colors to enter a custom color value. If your course has closed captions, you can also choose a Captions font. And you can increase or decrease the font size for all player elements and closed captions by adjusting the Player font size percentage. It defaults to 100%, but you can choose any percentage between 75% and 200%.